It is easy and very quick to assemble, with clip-fit polystyrene brochure holders. The silver anodized frame and stand come with heavy steel bases for optimum stability. The 15 x A4 brochures are durable with holder internal depth of 35mm. 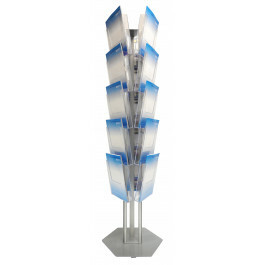 Leaflet and brochure display stands are freestanding holders that make them easy to walk around. The boxes or holders are arranged in a vertical alignment and facing opposite to each other, which allows each holder to display the brochures they are representing clearly. Ideal to be used in exhibitions, events, book stores, banks etc. They are the best way to make people take away brochures meant for them. It is eye catching, easy-to-use and recyclable.